The Olympics are amazing. I have been glued to TV in awe, so I haven't made time for paper playing! 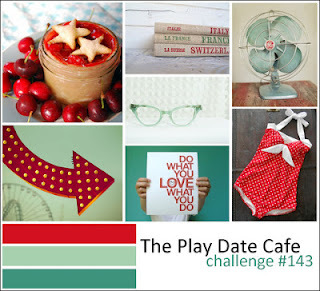 The play date cafe challenge #143 has my favie colooorrrssss. You know the ones: cherry, mint julep, and jade. Or as I know them, red and teal. I made a birthday card for my friend's little boy who is turning 6. I used some punch outs from an old birthday stack (me and my big ideas, i think), october afternoon's "cakewalk" papers, and my new Sew Easy tool to thread the bottom. I gotta say, the Sew Easy tool was not so easy. But I covered up the flaws and it looks ok in the end, just took many many practice runs! Super cute birthday card!! Great way to use these colors! Love your sewing - that's fun tool to play with. I should pull mine out and use it more often (along with everything else I own!!) Thanks for playing again this week at The Play Date Cafe!! I love this card, Rachel! The colors and papers are beautiful! This is really cute. I love how you made the "d" stand out in the greeting! Thanks for playing along with us at The Play Date Cafe! What a great birthday card, Rachel! The elements are so fun together. Your sewing looks great despite your troubles.. maybe practice makes perfect? I've never tried the Sew Easy, so I don't know! Thanks for joining us for this week's color challenge at the Play Date Cafe! Your card is absolutely WONDERFUL! Such a great take on the PDC colors! The sew easy is quite tricky - I think! What a great idea for this color scheme, it works perfectly for this card! ~ Thanks for playing along at The Play Date Cafe, see you next time! Awesome card! Thanks for playing with us at The Play Date Cafe!